Meet the Auto-B-Good gang, a bunch of friendly cars who travel through life getting into all sorts of crazy adventures! Each DVD features six fun episodes that teach important values. Approximately 60 minutes each. About "A Road Less Traveled (#02 in Auto B Good Dvd Series)"
Welcome to the City of Auto - A wonderful world of cars. Join Johnny, EJ, Izzi and the rest of the cars in these high-octane adventures along the road of life. Each collection features six award-winning short stories. 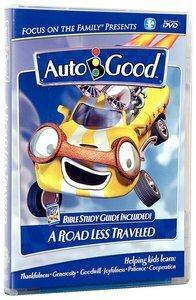 Auto-B-Good is Premium Grade Values and Full-Throttle Fun! Hop in and enjoy the ride!Included on the DVD, Episodes 13-18:Friends in High Places - ThankfulnessIzzi is feeling blue. Although she appreciates the help from friends, Izzi wishes she could do things for herself. A mishap at the talent show might prove to be the perfect opportunity to shine! She discovers everyone is built for a purpose. Heavenly Event - GenerosityEveryone is excited about the extraordinary meteor shower. As EJ leaves to watch the shower he has an injury that will cause him to miss out, unless...Sunny Side Up? - GoodwillOne small thought... three friendships! Can one small thought be enough to hold them together or what splits them apart?Up From The Depths - JoyfulnessWill the Professor ever invent again? His latest work ended up as so many before... a failure. Professor is throwing in the towel, unless a few friends can convince him otherwise.Cooler Heads Prevail - PatienceIt seems that Johnny has to wait for everything today. As the frustration begins to boil over, Derek comes along. But can they put aside their anger to save their friends?Digging for Gold - CooperationIt's the State of Good's Spelling Bee! A massive snow drift is keeping Izzi from the competition. Will the help of her friends be enough to dig her through?